Capturing the day as it unfolds. This is a package that enables you to have stylistic and friendly images for an affordable price. This covers all consultation, editing and selecting costs. 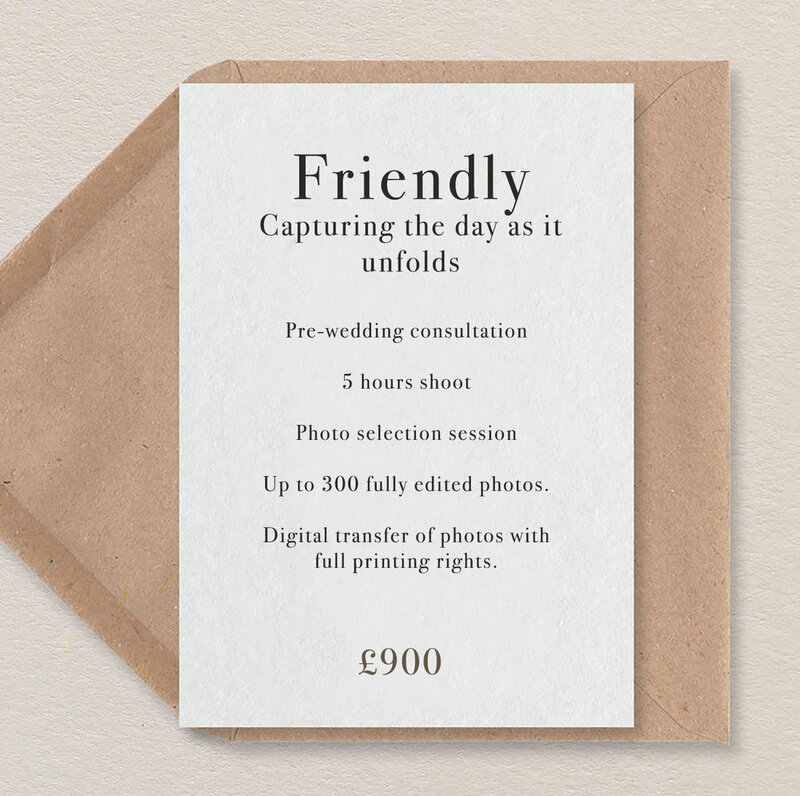 Sometimes, my favourite weddings are the friendly, sociable weddings, which is why I’m happy to offer a friendly, no surprises, rate. This package is designed for those who want to have a hassle-free photographer, and have the important moments captured as they unfold. We will have a pre-wedding consultation on the phone so I can get to know a little more about yourselves, the schedule and the venue on the big day. We’ll figure out the best times for me to come and shoot to ensure that you get the maximum out of the 5 hours’ photography time. I’ll arrive at whatever time is best suited to capture the most important things within the 5 hours. I’ll capture the day as it unfolds naturally capturing the truthful moments in an artistic and flattering way. You’ll be thrilled with the fly-on-the-wall style photos that are captured. You will receive up to 300 fully edited photos via digital transfer - straight to your computer or phone. These come with full printing rights. No extra fees, no surprises. Just a perfectly friendly and hassle-free way of capturing the day.